All the rooms are having refrigerators for storage of food items of guests. 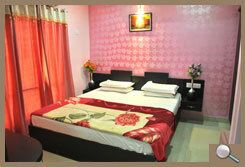 Rooms are fully air-conditioned, which provides comfortable stay for our guests. All rooms are with LCD's. All rooms are well ventilated. Our house keeping staff are always ready and willing to give their according to the demands of our guests on proper time. All the rooms are well-furnished. STD/ ISD call services are available for our guests & intercom facility is available to communicate within the rooms,to whom guests want to communicate. Vehicle & transport facility is available. Hair dryers are available . Presidential rooms are having Dining Table. Shower panel in presidential suit rooms. Tea kettle is present in presidential suit rooms. * Service charge @ 10% extra & luxury tax as applicable. *we accept all major cards.